This is one gorgeous eggplant! 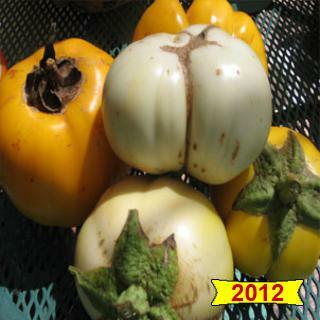 Thai White Ribbed eggplants are extra large white fruits that have very deep fluting. Slices look like flowers. Heirloom Seed Packet. Thai White Ribbed is one gorgeous eggplant! Extra large, white fruits have very deep fluting. Slices look like flowers. Plants are very high producing. Pick before they start to turn yellow and enjoy!